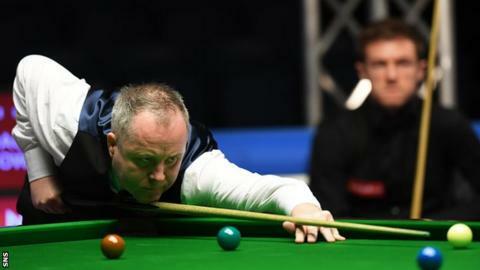 Four-time world champion John Higgins hopes "one last push" of form can help him land the Scottish Open title. The Scot lost the 2016 final 9-4 to Hong Kong's Marco Fu at Glasgow's Emirates Arena and is already through to the second round this year. Higgins, 42, beat England's Jack Lisowski 4-1 on Monday. "Everybody's going to give it one last go," said Higgins, who won the tournament twice when it was called the International Open. "We've played a lot of snooker the last three or four months with a lot of travelling, but one last push to do well before Christmas and then I'll have two or three weeks off. "I've got decent memories from last year but just fell at the final hurdle, so I'd love to go one better. "I'm very happy to get through the first round because Jack was one of the toughest ones I could have faced. "The first frame I got off to a decent break - I was 50 in front with three reds left and I somehow lost the frame. So I wasn't looking good 1-0 down. "But my safety was the difference in the game today; it was pretty good and I knew it had to be because Jack's a really dangerous player. My safety managed to get me a few chances and I took them so happy days." Higgins was feeling low after being defeated by Mark King in the last 16 of the UK Championship in York last week but insists he is back in a positive frame of mind for Glasgow. "Even when I was 4-2 up on Mark King, I was thinking I was going to lose 6-5, and when you think it sometimes that's what happens," he added. "I was pretty down on myself but I knew I had to snap out of it quickly because you want to do well in front of your home fans."